There's no doubt that one of the biggest attractions at the State Fair of Texas is the food. And yes, a lot of it is ingenious fried food, like fried lattes, fried Oreos, and fried ice cream. Essentially, if it can be dropped in batter and deep fried, you will find it at the State Fair of Texas. And it will likely be delicious. Concessionaires spend all year thinking up these outlandish-sounding creations, and fairgoers show their appreciation by chowing down with gusto. You can get up to some serious mischief with the fair's abundant high-fat, high-carb eats, or you can tread a wiser course with the many gluten-free vittles available at the annual celebration of all things Texas. Whatever you choose, bring a hearty appetite (and maybe an antacid) to enjoy some of the best treats at any state fair. These are our picks for the best of the best. The crunchy, golden brown nuggets of goodness known as Fletcher's Original Corny Dogs are a Dallas original and a beloved State Fair tradition. Preferably with a dollop of yellow mustard. Their Dallas ​inventors, Carl and Neil Fletcher, claimed the legendary deep-fried, corn-battered hot dog on a stick as America's first corn dog. About half a million of them have been sold at the State Fair of Texas since 1942. Go to a State Fair college football game, and you'll find fans there calling them "breakfast of champions." Fernie's Funnel Cakes have been a State Fair tradition since the 1980s. Made of twisty batter that's deep-fried, dusted with powdered sugar, and given an optional fruit topping, these treats have long been a favorite of fairgoers. Formerly a rarity, funnel cakes are available these days as grocery store mixes. But they're not nearly as good as the handmade originals. They're the winners, hands down. Maybe the crazy name is why fried lemonade didn't win a Big Tex Choice Award for flavor. But trust us, this is one of the best-tasting treats at the State Fair. This absolutely delicious dish should have been renamed Fried Lemon Pound Cake since it consists of a few mounds of lemon pound cake fried up a bit like a doughnut. A glaze at the bottom of the cup might have won over Choice Award judges if it had been drizzled on top of the delicious morsels instead. This is another case of a misleading name, but we're not complaining. Deep Fried Latte is not a frozen drink but a wonderfully fried pastry topped with cappuccino ice cream, caramel sauce, whipped cream, and instant coffee powder. Who's to say you can't have ice cream for breakfast, especially this way? Deep Fried Latte was named the "Most Creative" State Fair food creation in the Big Tex Choice Awards of 2007. If you can deep-fry an Oreo cookie, you can deep-fry just about anything. Deep-fried Oreos are everything you want in a classic treat. The only thing missing is a cold glass of milk. This is one sweet at the fair that you don't want to miss. Some people go to the Texas State Fair just for the deliciously smoked turkey legs, wrapped at the base with aluminum foil for easy handling. It's fun to watch fairgoers casually stroll through Fair Park caveman style, with a humongous turkey leg in one hand. Definitely LOL-worthy. It also may be one of the healthier choices at the concession stands. There's something truly special about cotton candy at a fair, and you can find it just about everywhere at this fair. The airy pastel-colored spun sugar on a cone is something we all loved as children, and as adults, it brings out our inner child. Texas is known for Tex-Mex dishes, and although this savory delight barely qualifies, it stands on its own merits as pure indulgence. You take tamale filling, you​ bread it and you fry it. There's nothing wrong with that picture. 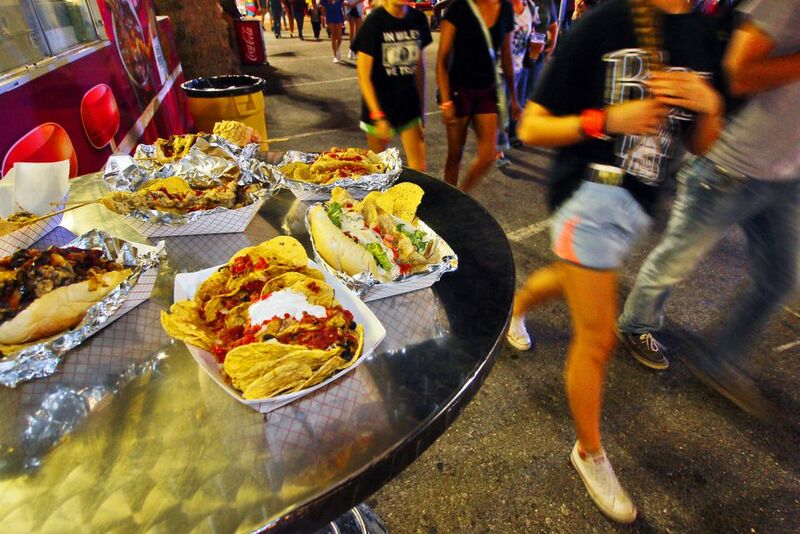 What Is the Best Gluten-Free Food at the Texas State Fair?